New Updated Resource Estimation 4,626,250 PdEq Ounces, With 2,713,933 Ounces in Inferred NI 43-101 Update River Valley Platinum Group Metal Deposit, Sudbury, Ontario – New Age Metals Inc.
River Valley is the largest undeveloped primary PGM resource in Canada, the March 2018 NI 43-101 has updated the 2012 resource. The River Valley PGM Project has excellent infrastructure and is within 100 kilometers of the Sudbury Metallurgical Complex. The project is 100% owned by New Age Metals. 4,626,250 PdEq ounces, with 2,713,933 ounces in Inferred at a 0.4 g/t cut-off. Our stated objective of increasing the resource beyond 1Moz in the northern portion was achieved. 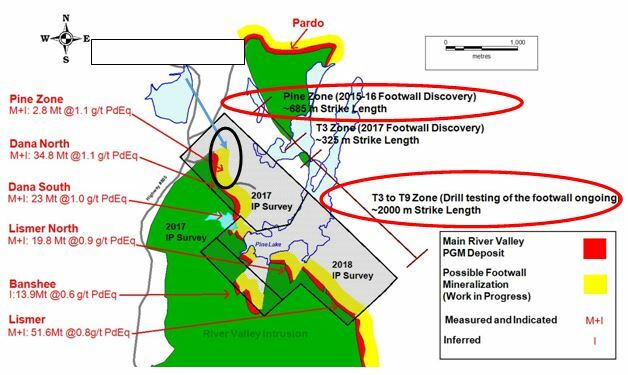 Footwall PGM mineralization, “The Pine Zone/T3”, a new discovery and additional source of PGMs at the River Valley Project (RVP), was included in the new resource model. Winter ground IP geophysics report to be interpreted by Alan King to help identify further drilling in the northern portion of the project and the new targets from T3-T9. Geological interpretation of the March 2018 NI 43-101 geophysical report is ongoing to target and better define the summer/fall 2018, winter 2019 drill programs. WSP Canada, under the supervision of Todd McCracken, P. Geo (Manager-Mining at WSP Canada) has recently completed the new NI 43-101 compliant resource estimation of the River Valley PGM Deposit in the Sudbury Mining District of Ontario, Canada. The new resource estimation has incorporated all the past data, geophysics, new drilling since 2015 and the River Valley Extension (RVE), including the additional drilling in the new footwall discoveries Pine Zone and T3. Our Corporate Mandate is to build a series of open pits (bulk mining) over the 16 kilometers of mineralization. We will mine, crush, and concentrate on site, then ship the concentrates to Sudbury. The objective of the company was to increase the northern portion (Pine Zone/Dana North) to 1Moz and the company achieved this. In 2017, the company had a ground IP survey conducted over the area of the newly discovered Pine Zone (2015-2016) footwall PGM mineralization (News Release: June 19th, 2017). The geophysical survey was a high-resolution OreVision® IP survey performed by Abitibi Geophysics, (Thunder Bay, Ontario). OreVision IP can reveal targets at four times the depth of conventional IP without compromising near-surface resolution. Recently a second phase of ground IP geophysics has been completed on an area south of the Pine Zone and over the T4 to T9 target anomalies. The new survey area represents a strike length of approximately 2000 metres. The final report from Abitibi Geophysics is being compiled. The company will outline a series of drill programs to test the new geophysical anomalies generated from the survey and outline additional drilling in the Pine Zone area. Expert Process Solutions (XPS), based in Falconbridge, Ontario has been engaged to perform mineralogical studies of the PGM mineralization. Management believes that a better understanding and characterization of the River Valley PGM mineralization will be a guide in future endeavors and development work including improved flowsheet and processing options in preparation for a Preliminary Economic Assessment (PEA) Report. Further updates in the mineralogy will be forthcoming. Figure 1: Northern Portion of the River Valley PGM Deposit Showing Regions of Current IP Geophysics and grade at a 0.4g/t cut-off. NOTE: Image only represents approximately 3.5 km of the 16 km of the overall strike length of the River Valley PGM deposit. The Yellow Band represents the footwall potential area of the River Valley Deposit based on the results of the Pine Zone where footwall mineralization was noted to extend 150 meters eastward from the Pine Zone/ T3 main deposit. At present the only area that has confirmed footwall mineralization is in the Pine Zone (defined from 2015 to 2017 drilling). Geophysics and exploration are in progress to test other areas of the project. Management’s specific focus is to outline a sufficient economic resource in the northern portion of the project, and then develop a series of open pits (bulk mining), crush, and concentrate on site, then ship the concentrates to Sudbury. Our stated objective was to increase the northern portion of the project (Pine Zone/Dana Zone/Lismer Zone/Banshee) to 1 Moz and the March 2018 43-101 has achieved this objective. To date an approximate 140,659 meters (461,480 feet) in 628 drill holes have been conducted by the company as operator on the River Valley Project. Several independent NI 43-101 compliant resource estimations have previously been generated for the deposit through the exploration and development phases. In 2016, the company purchased 100% of Mustang Minerals’ southern portion of the River Valley contact (River Valley Extension, News Release – Oct 5th, 2016). This added 4 kilometers of mineralized strike length to the southern portion of the company’s main River Valley Project. The River Valley Deposit’s present resource, with approximately 4.6M PdEq ounces in Measured Plus Indicated mineral resources (0.4 g/t cut-off) and near-surface mineralization, covers over 16 kilometers of continuous strike length. The acquisition of the RVE adds an additional 4 kilometers for a total of 16 kilometers of strike. The March 2018 NI 43-101 report added a new inferred resource of PdEq (Oz) for a total of 729,658 ounces at a 0.4 g/t PdEq cut off on the River Valley Extension (RVE). The company continues to explore and enhance the River Valley PGM Deposit. Figure 2: The Yellow Band represents the footwall potential area of the River Valley Deposit based on the results of the Pine Zone where footwall mineralization was noted to extend 150 meters eastward from the Pine Zone/ T3 main deposit. At present the only area that has confirmed footwall mineralization is in the Pine Zone (defined from 2015 to 2017 drilling). Geophysics and exploration are in progress to test other areas of the deposit. Management’s specific focus is to outline a sufficient economic resource in the northern portion of the project, and then develop a series of open pits (bulk mining), crush, and concentrate on site, then ship the concentrates to Sudbury. NAM’s flagship project is its 100% owned River Valley PGM Project (NAM Website – River Valley Project) in the Sudbury Mining District of Northern Ontario (100 km east of Sudbury, Ontario). Presently the River Valley Project is Canada’s largest undeveloped primary PGM deposit with Measured + Indicated resources of 160 million tones @ 0.44 g/t Palladium, 0.17 g/t Platinum, 0.03 g/t Gold, with a total metal grade of 0.64 g/t at a cut-off grade of 0.4 g/t equating to 3,297,173 ounces PGM plus Gold and 4,626,250 PdEq Ounces. This equates to 4,626,250 PdEq ounces M+I and 2,713,933 PdEq ounces in inferred. The Company has five pegmatite hosted Lithium Projects in the Winnipeg River Pegmatite Field, located in SE Manitoba. Three of the projects are drill ready. This Pegmatite Field hosts the world class Tanco Pegmatite that has been mined for Tantalum, Cesium and Spodumene (one of the primary Lithium ore minerals) in varying capacities, since 1969. NAM’s Lithium Projects are strategically situated in this prolific Pegmatite Field. Presently, NAM is one of the largest mineral claim holder for Lithium in the Winnipeg River Pegmatite Field. On January 15th 2018, NAM announced an agreement with Azincourt Energy Corporation (see Jan 15, 2018 and Feb 22nd, 2018 Press Releases) whereby Azincourt will commit up to $3.85 million dollars in exploration, up to 3 million shares of Azincourt stock to NAM, up to $210,000 in cash, and a 2% net smelter royalty on all 5 projects. Exploration plans for 2018 are currently in progress. The Mineral Resources for the River Valley Project disclosed in this news release have been calculated by Mr. Todd McCracken, P.Geo., an employee of WSP and independent of New Age Metals. By virtue of his education and relevant experience, Mr. McCracken is a “Qualified Person” for the purpose of National Instrument 43-101. The Mineral Resource has been classified in accordance with CIM Definition Standards for Mineral Resources and Mineral Reserves, (May 2014). Mr. McCracken, P.Geo., has read and approved the contents of this press release as it pertains to the disclosed Mineral Resource estimations.